It was only after the 1970s that part of the Avá-Canoeiro began to have permanent contact with the surrounding society. Some groups, however, remain isolated. The present situation of this group is critical due to the small number of individuals and the precarious living conditions they are subjected to. Their ability to adapt has been their main strategy for survival, because, since the beginning of the 19th Century, the occupation of their traditional territory by farms, 'garimpos' (gold prospecting areas), towns and cities has forced the Avá-Canoeiro to frequent dislocations through different eco-systems and contexts. They are also called Cara-Preta (Black Face). From the 18th Century until 1960 they were simply named Canoeiro (Canoeman). In the 19th Century they were also referred to as Carijó. The name Avá-Canoeiro appeared in the beginning of the 1970s, during the contact with the group that lives on the region of the Araguaia River. The Avá-Canoeiro speak a language of the Tupi-Guarani family, of the Tupi branch. There are different dialects between the groups of the region of the Araguaia River and those of the Tocantins River. There are currently two groups of Avá-Canoeiro living in permanent contact with the national society. In the State of Goiás, they are established in the Avá-Canoeiro Indigenous Land, in the municipalities of Minaçu and Colinas do Sul. In the State of Tocantins, they live in the Boto Velho, or Inãwebohona, village, in the Inãwebohona Indigenous Land; in the Canoanã Indigenous Post and in the Araguaia Park Indigenous Land, in the municipalities of Formoso do Araguaia, Lagoa da Confusão, Sandolândia and Pium. In addition to those groups of the Tocantins and Araguaia rivers, there are two others that have not yet been contacted by Funai. One of them probably moves about the mountainous region of the headwaters of the rivers that form the Upper Tocantins River, in the State of Goiás, and the other probably lives in the Northern part of Bananal Island, inside the Araguaia Park Indigenous Land, in the State of Tocantins. The linguistic and historical studies made by Nimuendajú in 1914 (apud Baldus,1970:71) and by Rivet (1924:172) affirm that the Avá-Canoeiro descend from the Carijó of São Paulo, and were supposed to have been brought to Goiás in 1724 or 1726. They came with the 'bandeira' ('bandeiras' were expeditions to the interior organized in colonial times to hunt Indians and look for gold, mostly from São Paulo; they are credited with the expansion of the borders of Brazil to the West) of Bartolomeu Bueno to help in the defense against local Indians and to work in mining. With the end of the bandeira, the Avá-Canoeiro would have recovered their existence as an autonomous group, but remained in Goiás. More recent linguistic studies by Aryon D'Alligna Dall'Igna Rodrigues, however, revealed that the language spoken by the Avá-Canoeiro is closer to the dialects of the Tupi-Guarani family of Northern Brazil. That contradicts the explanation of the Southern origin of the group and questions the adequacy of the name 'carijó', which was the name given to the Guarani of the South coast captured by the 'paulistas' (inhabitants of São Paulo) and taken to the interior in the 'bandeirante' expeditions. The earliest references to contact with them date from the beginning of the 19th Century, when the location of the 'Canoeiro' was given according to their distribution along the Tocantins River and its tributaries. Chroniclers make reference to conflicts of the group with local inhabitants such as farmers and 'garimpeiros' (gold prospectors). From 1820 on, the Canoeiro could be found not only along the rivers but also in the high mountains between the Maranhão River and the localities of Santa Tereza and Amaro Leite, as well as in a few villages on the Canabrava River and in other places. The Canoeiro maintained their hostile relations with the regional population, and several Provincial governments sent official expeditions to fight the group. They lived on a strategic area for the incipient occupation of Goiás at the time, since they were right in the expanding cattle-raising area and in the middle of the route (the Tocantins River) connecting the region's two most important centers of regional development (the provincial capital, Goiás, and Porto Real, today Porto Nacional). In a reaction to the increasingly violent conflicts, some Canoeiro groups started, between 1844 and 1865, to move towards the Araguaia River (Rivet,1924:175). By the end of the 19th Century they had reached the neighborhood of Bananal Island. Part of the group, however, remained in Goiás, moving around the steep and inaccessible mountains of the region. Thus in the beginning of the 20th Century the Canoeiro were scattered through an extensive area from the foothills of the Dourada Range to the interior and East of Bananal Island. 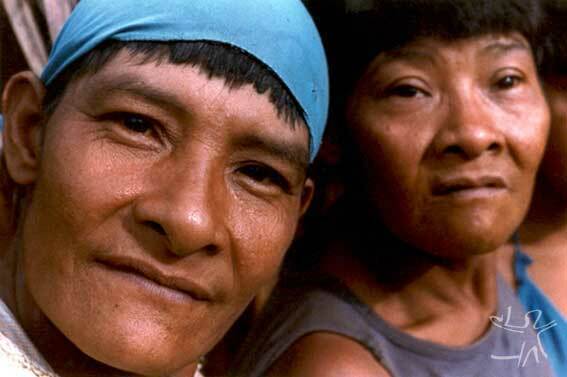 Separated, the Araguaia and Tocantins groups began to have different histories from then on. The groups of the Upper Tocantins remained between 1940 and 1998 in the municipalities of Santa Tereza, Cavalcante and Campinaçu. During this period, the armed conflicts with farmers and other occupants of the region continued. The first official team (front) to attract these groups began its work around 1946, with the establishment by the CNPI (Conselho Nacional de Proteção ao Índio - National Council for the Protection of the Indian) of the Canoeiro Post on the Trombas range, in the region of the Canabrava River. According to the participants, at the time the Indians had their villages in the regions of Dueré, Natividade and Peixe. The team built roads, claimed to have had visual contacts with the Indians, was supposedly successful in giving them presents but failed to establish any concrete contact with the Avá-Canoeiro. The work of this first team was probably suspended in 1950. Attraction initiatives were resumed only in 1969, after farmers of the municipalities of Cavalcante and Niquelândia demanded an action by Funai because of the slaughtering of cattle by the Avá-Canoeiro. According to the farmers, the Indians used spears with iron tips and were called 'quilombos' in the region. Funai attraction teams continued to operate in the 1970s. However, they failed to establish contact with the Indians and were accused of corruption and of having some of its members involved in the illegal commerce of lands then occupied by the Avá-Canoeiro. While Funai continued its inefficient work, many farmers paid or kept groups of armed 'jagunços' (heymen) to 'clean up' the area of Indians. It was at this time that the villages the group had near the Jacira, Descobertas, Limeira, Boa Nova and Abaixo creeks were abandoned. Of all the attacks against them, one that was especially violent was carried out in 1966. Farmers and local dwellers took by surprise a whole village; 15 Indians - the majority of the villagers - were killed, and the survivors ran away. The dead bodies were placed inside one of the huts, which was subsequently set on fire. At the time, the attraction team said nothing about the episode to the local Funai office or to the press. Because of those attacks, the majority of the Avá-Canoeiro of Mata do Café village crossed the Maranhão River and found refuge in the mountain ranges of the municipality of Cavalcante, to the East. The work of Funai's attraction team in the Upper Tocantins River continued unsuccessfully until the 1980s. In October, 1983, a group of Avá-Canoeiro, remnants of Mata do Café village, formed by two women, a boy and a girl, decided to make contact with local inhabitants. 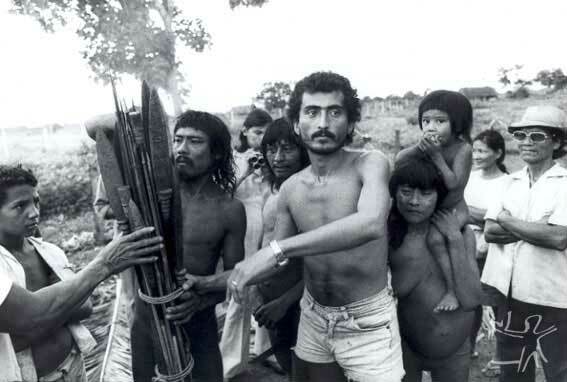 In April, 1985, anthropologist André Toral, author of this entry and then chief of the Attraction Team, and the chief police officer of Araguaína succeeded in obtaining the interdiction of the Avá-Canoeiro Indigenous Area. Currently the Avá-Canoeiro of the Upper Tocantins River are divided into two groups. The one that was contacted in 1983 lives near the Attraction Post. The other group, strayed, moves around the Avá-Canoeiro Indigenous Area and in the region between the Preto and the Bagagem rivers, on the mountain ranges near the Maranhão River. The point of dispersal of this group seems to be the same as that of other strayed and contacted Indians: the Mata do Café and the mountain ranges of the municipalities of Niquelândia, Cavalcante and Minaçu, along the Upper Tocantins River, where they left from in the end of the 1970s. As for the Araguaia groups, the first attempts to make contact with them took place around 1940, when bishop D. Sebastião Tomaz, of the Conceição do Araguaia Prelacy, tried a peaceful (and unsuccessful) approach with the Bananal Island Avá-Canoeiro, who responded with arrows and thus expressed their desire of remaining isolated. New attempts were carried out by Funai only 30 years later. 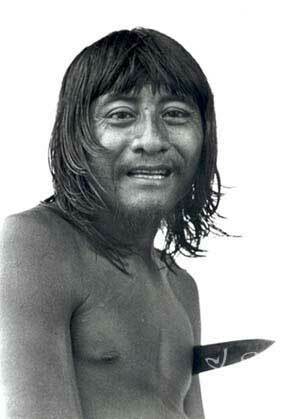 On the first semester of 1974, eight Avá-Canoeiro were contacted and transferred to the Canoanã Indigenous Post. Lacking resources, the Post staff was unable to prevent the deaths of three Indians caused by the flu and other diseases that same year. In 1988 this group was transferred to the Avá-Canoeiro interdicted area, on the Upper Tocantins River, in Goiás. The experience of putting together both groups did not work, and soon afterwards the Araguaia group was back in the Canoanã Indigenous Post. In the past few years the Tocantins Avá-Canoeiro have been suffering the impact of the Serra da Mesa Hydroelectric Plant, operated by Furnas Centrais Elétricas S.A., a subsidiary of Eletrobrás. The plant is contiguous to the Avá-Canoeiro Indigenous Land. Thanks to an agreement with Funai, Furnas is expected to deposit the equivalent to 2% of the amount it distributes as royalties to the municipalities that had areas flooded by the plant's reservoir. The resources will be managed by Funai, with the help of the Federal Prosecutor's Office, until the Indigenous community is considered in conditions of managing them directly. Besides having part of its area flooded, the Avá-Canoeiro Indigenous Land is crossed by roads and power transmission lines; it also harbors other works related to the Serra da Mesa plant. The Araguaia Avá-Canoeiro that remain strayed continue to move around the region. The most recent news place them in the interior of Bananal Island, on the Northern part of the Mata do Mamão. Since there are no government attempts to effectively find them, they are exposed to the actions of criminals, without Funai or the National society ever learning of it. The Araguaia Avá-Canoeiro who have been contacted live in the Canoanã Indigenous Post, in the Araguaia Park Indigenous Land (with an area of approximately 1,395,000 hectares), on the Javaés River, on Bananal Island, in the Southeast part of the State of Tocantins. The park occupies the island's Northern third. The Avá-Canoeiro still without permanent contact live in the North of Bananal Island, in the areas of the Araguaia Indigenous Park and the Araguaia National Park. Funai started in 1991 the process of clearing off the Indigenous Park of its non-Indian occupants - 'retireiros' (people who milk cows) and small cattle raisers. Of the approximately 900 settlers and invaders, 208 are still there, most of them in the Southern part of Bananal Island. The process of regularization of the lands of the Tocantins Avá-Canoeiro began with a directive signed by Funai's president on April 8, 1985, which interdicted an area of 38,000 hectares in the municipalities of Cavalcante and Minaçu, in the State of Goiás. The directive sought to preserve the areas where the Avá-Canoeiro moved about and the area then occupied by the group who had made contact in 1983. A directive issued by the minister of Justice on October 2, 1996, declared the Avá-Canoeiro Indigenous Land of permanent possession by the Indians. The area, however, is still occupied by a large number of non-Indians, who want to be compensated before moving away. Among those without contact with Funai, the estimate is that the Upper Tocantins group counted ten people and the Araguaia fifteen. In general, the Avá-Canoeiro population, which probably has never exceeded 300 people, was most sharply reduced between 1960 and 1970, when it was corralled by the occupation process in the States of Goiás and Tocantins. If the present small number of remnants will be able to survive as an Indigenous group and as an autonomous community is an open question. Historically, the Avá-Canoeiro bands have managed to survive in isolation even with smaller population contingents. The younger ones, however, resent the isolation of the region where they live now. Differently to what might be expected, the system of intense nomadism is a historical contingency that affected the Avá-Canoeiro at different times and with different results as well. There is no indication that this a group whose culture is fully adapted to such regime. On the contrary, all evidences suggest that the group has forms of subsistence - such as agriculture combined with hunting and gathering - that indicate a seasonal nomadism, very different from the regime of continuous movement it has been forced into in the last 100 years. Forced to move around for at least four decades, the Upper Tocantins groups stop activities such as agriculture and ceramics, resuming them when conditions are favorable. As for the descendants of the groups that left towards the Araguaia around 1840-60, they do not plant anything and live exclusively of hunting and gathering and of the plundering of fields and cattle. Activities that are not compatible with a nomadic lifestyle have been forgotten. Differently to the Tocantins groups, the Araguaia ones have abandoned activities such as ceramics, flute music, pipe manufacturing and smoking. Comparing both groups, one can conclude that the Avá-Canoeiro who have been 'on the move' longer, such as the ones from the Araguaia, have lost and/or stopped making a series of items of their material culture. This people's remarkable capacity for adapting should be stressed though, since the variety of eco-systems and contexts in which they live was quite large. Its material culture is limited to a few dozen items, of which the only ones that do not have strictly practical usage are musical instruments and pipes. Body painting and feathers have virtually disappeared. In contrast, the Avá-Canoeiro have incorporated a series of elements of Brazilian origin to their material culture, especially foodstuffs and metal articles. It is possible that such incorporation may have occurred before their arrival to Goiás and their characterization as an isolated group. When set apart from colonial society, the acquisition of such products became a problem. They often resorted to thefts, robberies and even plundering. Today they limit themselves to thefts or the use of metal products discarded by the 'white' population, such as abandoned automobiles, cans and other metal items that can be found at garbage dumps in the outskirts of cities, in farms or in towns. The use of metal instruments and tools is traditional in the group. The Avá-Canoeiro have developed techniques for working the cold metal, giving it the appropriate shape for the use it is designed to have. Thus old springs from abandoned automobiles become blades of rustic machetes, gasoline drums are turned into arrowheads, nails are transformed into fishhooks etc. Metal-headed arrows may be the most characteristic product of Avá-Canoeiro manufacture; they have been known and their existence has been registered by several authors since the beginning of the 19th Century. Other artifacts of their material culture reveal a proximity with materials that come from regional culture. The slaughtering of cattle and horses was so frequent that it gave origin to a series of articles made of leather, horns, hooves, horse hair, old ropes, pieces of cloth, salt (which they take from mangers in pastures), nylon threads, bags and agricultural instruments and products they find stored away in the fields of the regional population. Because of their close links to all those products and because of the importance of cattle raising and planting fields in their diet, it is doubtful that the geographic movements of the Avá-Canoeiro really have the objective of keeping complete isolation from the regional population. Probably the objective was to find a region in which it would be possible to maintain an intermediate position vis a vis the national society: neither totally isolated nor too close. Their habitat, in the recent past, should combine those apparently contradictory characteristics: close enough to the 'whites' in order to take advantage of their resources, but in an area of slight human occupation where they could find refuge when needed. Under the Avá-Canoeiro point of view, the ideal region should also provide them with a permanent supply for hunting and gathering. As a survival strategy, the Avá-Canoeiro live in small groups with high mobility that move around over large extensions of Brazil's Central-West region, in the States of Tocantins and Goiás. In this sense, they do not differ from other Tupi groups, such as Maranhão's Guajá and others, forced by historical contingencies to permanent dislodgement. The Avá-Canoeiro oscillate between two types of subsistence regimes. Neither presupposes, however, independence and total isolation from the resources of the regional society. The first indicates more isolation, combined with a certain degree of permanence on a defined region. The second group presupposes rigorous nomadism and more dependence to the resources of the regional population, of its fields and animals. 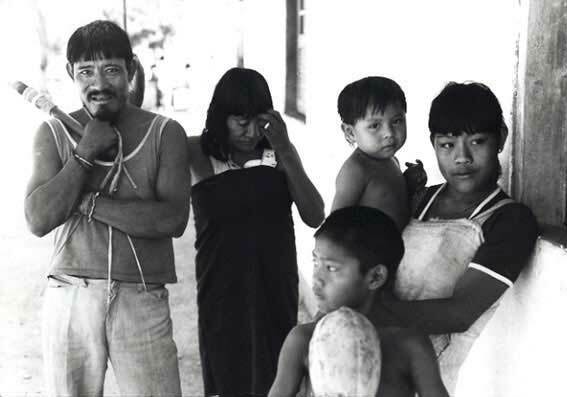 The first kind of subsistence regime was practiced in the Upper Tocantins River area before the 1970s, when the Avá-Canoeiro were forced to move away from the fertile forests of the region. They planted in areas of high forest, and combined it with hunting and gathering. The Araguaia groups, contrary to the Tocantins', completely abandoned agricultural activities and adopted intense nomadism, constantly slaughtering cattle and horses. After the 1973 contact, the Avá-Canoeiro established on the Canoanã Indigenous Post did not develop any agricultural activity. On the contrary, until the end of the 1980s it was common for the older ones to go back to their former habits and slaughter cattle from neighboring farms when they were hungry, judging from the complaints from farmers and Funai employees. The Upper Tocantins group has a different attitude regarding agricultural activities. The place where they were put right after contact in 1983, on the Macaco Creek, for instance, was chosen by them in part because it is an area of old planting fields, as the many pre-existing clearings in the forest before the clearings carried out by Funai's employees indicated. The Avá-Canoeiro also cleared on their own a ravine some 800 meters from the Post, separated from Funai's planting fields, where they planted maize, rice and beans. Although on an irregular fashion, they followed all the steps of the planting calendar. The attitude of the Araguaia group towards agricultural works seems to be that of a people that is so adapted to nomadic life that it never practiced any kind of agriculture. Descending from those who left the Upper Tocantins region more than a century ago, they are probably the fifth or sixth generation of men and women who live in intense movement, thus not practicing activities that are not compatible with their nomadism, such as agriculture and ceramics. The slaughtering of animals, although intensified when the groups are in continuous movement, does not stop even when such movement is reduced long enough to allow the planting of small fields. The tiny group formed by three women and a young boy, in spite of its fragility compared to the large number of settlers of the Upper Tocantins region, until a short time before contact attacked regional production, slaughtering pigs and chicken and plundering planting fields throughout the time of their peculiar co-existence with the regional population. Immediately after contact, the Araguaia group slaughtered and ate a cow from the Canuanã S.A. farm every three days (O Estado de S.Paulo, January 24, 1974), which is certainly a high average favored by the exceptionality of the then-recent contact. After contact is made, however, in general they can no longer count with the clandestinity that had allowed them to slaughter animals and plunder planting fields. The permanence near the Post makes it impossible for the Indians to obtain food the way they used to do in the past, which make them dependent of government employees. Thus on the Avá-Canoeiro point of view there seems to exist a clear expectation of being fed by those employees, who restrain them from obtaining food in the traditional way. The logic of the recently-contacted Avá-Canoeiro seems to be: " if you, Funai employees, keep us from looking for our food the way we were used to, then you must see that we do not go hungry". On the other hand, the initiatives of the Funai employees of not feeding them and of insisting that they planted their fields and hunted on their own were not understood by the Avá-Canoeiro as a way of giving them more autonomy and of respecting their cultural particularities. Instead, they were seen as stinginess, and often generated resentment. 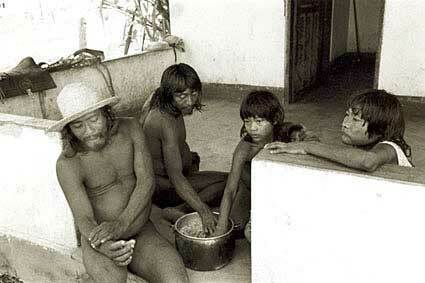 With their subsistence based on hunting and gathering and on plundering and slaughtering regional production, the Araguaia Avá-Canoeiro started to suffer from hunger regularly after their attraction in 1973. Becoming sedentary prevented them from hunting and gathering as they used to. The loss of clandestinity also made slaughtering animals difficult. The Canoanã Avá-Canoeiro's subsistence was thus divided in two periods: lack of food, when at the Post, and the rarer periods of abundance after hunting, when they had meat and vegetables. The latter were obtained by exchanging wild meat for agricultural products planted by the Javaé. The Araguaia Avá-Canoeiro live in the interior of Bananal Island, a depression in Central Brazil that has a vast drainage network made of mid-sized and large rivers, creeks, springs, 'ipucas' (areas where floodwater remains for a time after the river went back to its bed) and several lakes. The soils are generally acid, with low natural fertility. In the Eastern, higher part of the island, which corresponds to the Javaé territory, where the contacted and strayed Avá-Canoeiro live, there can also be found deep soils, with typical forest and 'cerrado' (as the savanna of Central Brazil are called) vegetation. The area is composed of 'cerrado', 'cerradão' (scrubland), dry and wet forest, extensive flooded areas, dry hillside and sand banks (Ministério da Agricultura/ IBDF 1981:27). In environmental terms, Bananal Island may be described as a transition zone between the 'cerrado' and the Amazon forest. For an Indigenous group that can be most aptly described as hunter and gatherer such as the Araguaia Avá-Canoeiro, the area is exceptionally favorable, offering resources for hunting and gathering and natural refuge from regional and Indigenous enemies, such as the Karajá and the Javaé, who were hostile until very recently. Forest zones, such as the Mata do Mamão, on the Northern part of the island, and the region's abundant 'cerrado' provide them the animal proteins and the vegetables that are the bases of their diet. There has never been a health or an education program designed specifically to the Avá-Canoeiro of the Canoanã Indigenous Post. Such lack of care caused the deaths of four of the Indians contacted in 1973, shortly after their arrival in the Post, killed by diseases against which they did not have organic immunity. The Avá-Canoeiro children were to attend the Post's school, which is designed exclusively to the bilingual teaching of Javaé and Portuguese - a serious problem for them since the Javaé speak a completely different language. That probably explains why the Avá-Canoeiro children practically do not go to school. Currently, all Avá-Canoeiro are illiterate. The younger ones manage, with much difficulty, draw their names. Contacted groups live in precarious health and foraging conditions and face the problem of lacking partners for their physical and social perpetuation. A possible solution to ensure the continuity of the Araguaia and Tocantins groups would be to put them together in one single community, but this looks increasingly more distant. Apart from each other for more than a century, the Tocantins and Araguaia Avá-Canoeiro have developed considerable cultural, including linguistic, differences. 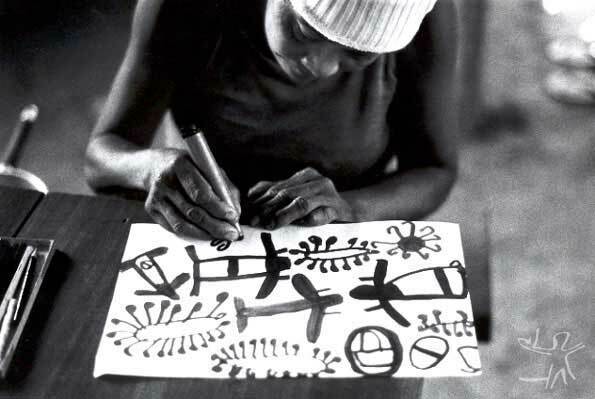 In 1988, Funai tried to put them together, but the experiment failed because of the lack of resources and of the isolation of the Avá-Canoeiro Indigenous Post compared to the busy Canoanã village where some oh them lived before. Besides, the Upper Tocantins region does not offer the older Avá-Canoeiro the same hunting quality as Bananal Island.